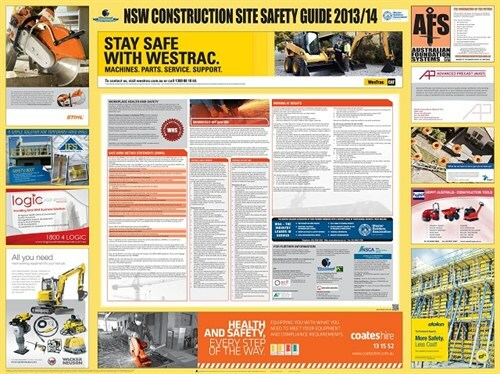 Safety information publisher Pro-Visual Publishing has released its latest construction site safety guide for the state of New South Wales. The NSW Construction Site Safety Guide 2013/14 was published with support from the Master Builders Association of NSW and the Australian Constructors Association and is distributed to all construction companies and sites across NSW free of charge. The wall-mounted chart covers topics highlighting the most common injury claims and safety issues within the field of work including working at heights, safe work method statements and ways to safely use power tools such as grinders and cut-off saws. Pro-Visual says it is crucial that workers recognise the hazards associated with power tools and the safety precautions one should employ when using these tools; as well as safety precautions when working at various heights.